On April 7, 2019, the congregation of Ness Ave. Baptist Church passed 4 motions toward a single initiative. It was decided that NABC should plant a new church, that this church should be plant in the Osborne Village neighbourhood, that Pastor Brennan should be sent to lead this, and that he will be released for full time ministry in that neighbourhood by June 30, 2020. On Feb. 3, 2019, following the service, Pastors Jeremy and Brennan hosted a question and answer session regarding the proposed church plant. In that meeting it was discussed that Ness Ave. Baptist Church (NABC) is considering planting a church in the Osborne Village neighbourhood of Winnipeg in September of 2020. The leadership of NABC invited the congregation to consider sending Pastor Brennan and his family from Ness as planting missionaries in their community of Osborne Village. The congregation was also brought up to speed on conversations Ness has had with other agencies. Support has now been received (pending congregational approval) from the Baptist General Conference national office, the Baptist General Conference of Central Canada, and Multiply Church Planting Network. During the meeting, our congregation chose to set April 7th as the date for a vote on the path forward for our church. The vote will take place by secret ballot for the primary question of whether the church supports planting. If passed, this will then be clarified with 3 successive motions to be discussed and voted on, namely; We will plant in Osborne Village; We will aim for a September 2020 launch; We will send Pastor Brennan to pastor this new church. It was also stated that one of the core pieces of the ministry philosophy for this new church would be that it is fundamentally neighbourhood based. People feeling called to join in the planting team would either have to be currently living in Osborne Village or be passionate about moving there to begin ministering to their neighbours. It was decided that we should set aside March as a month of prayer and fasting leading up to the March 31st vote to pursue God's will on the issue of church planting. 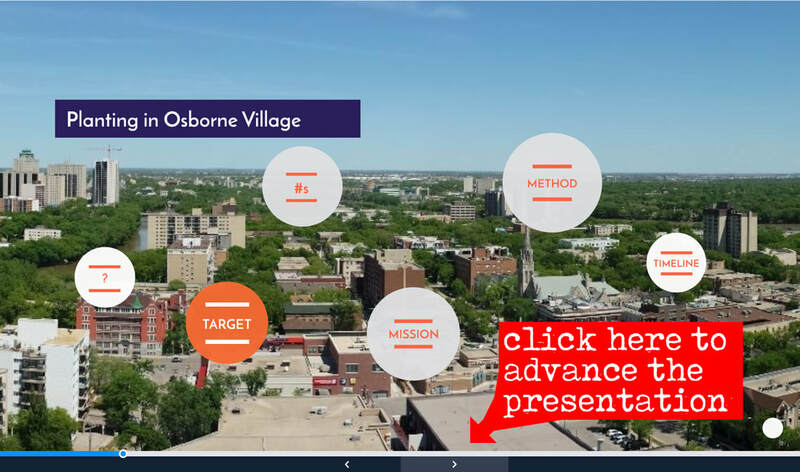 Pastor Brennan gave a presentation outlining the neighbourhood, culture, people, need, and ministry philosophy for planting in Osborne Village. You can view his presentation below. If you have any questions at all leading up to this vote, please don't hesitate to get in touch with one of the Pastors or Elders. ​At our quarterly meeting on Sunday, Sept. 30, 2018, Pastor Jeremy presented a vision for Ness Baptist's future. We feel, after much prayer, investigation, and conversation with the Elders of Ness, that God is leading us to leverage what we have for greater kingdom expansion. This idea was first presented to the board in June and the below presentation was the first presentation to the congregation. There are many questions yet to be answered; questions like where will we plant and what will the timeline be for launching a plant? We give some potential scenarios in the presentation but we are still a ways away from deciding upon the where, when and who. If you have questions about anything that is presented, we encourage you to talk with one of the pastors. In addition to this, we will have a forum for feedback and questions in addition to the regular updates at our business meetings. It is the leadership's desire to be as communicative as possible during this process and to allow the congregation ample time to pray through this direction and ask questions. The actual vote of direction will not happen until March 2019. Thank you! Ness Baptist Church has begun the process of partnering with the Baptist General Conference and the C2C Network Canada in the pursuit of planting in the Winnipeg Area. Here is a video describing the C2C Network and their mission. C2C network from C2C network on Vimeo.